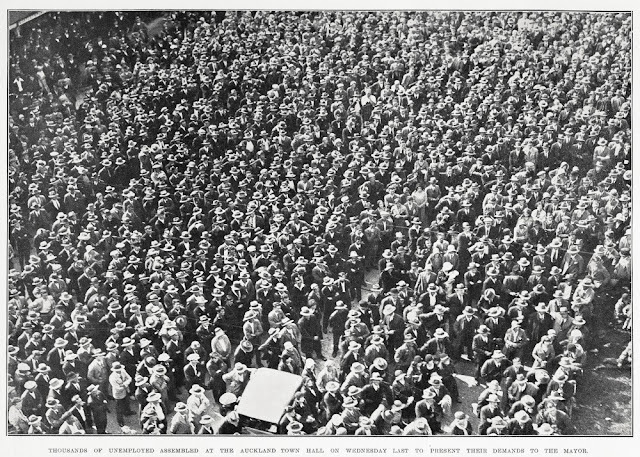 Thousands of unemployed assembled at the Auckland Town Hall. Auckland Weekly News, 20 April 1932. Auckland Libraries Heritage Collections, AWNS-19320420-46-1. Jim Edwards addressing demonstrators. 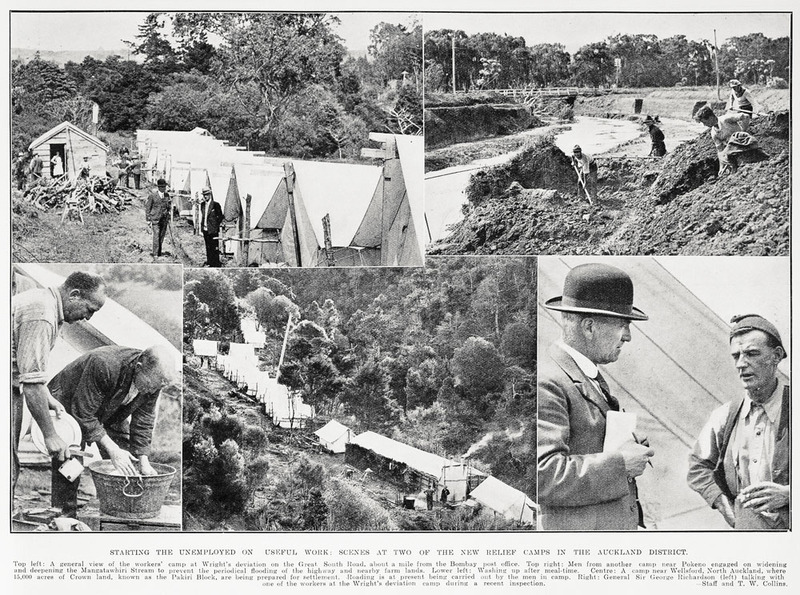 Auckland Weekly News, 20 April 1932. Auckland Libraries Heritage Collections, AWNS-19320420-46-2. Pickets from the fence of the Methodist Central Mission. Auckland Weekly News, 20 April 1932. Auckland Libraries Heritage Collections, AWNS-19320420-38-1. Jim Edwards’ son, James, said “to appreciate what… brings normally law-abiding people to the point of desperation that rioting implies, you must consider the background of these hard times.” He was 14 in 1932, moving around a series of rented inner-city Auckland houses with his family. In one, his pregnant mother’s bed was a broken door placed on a couple of apple boxes. The family relied on the Salvation Army’s horse-drawn soup kitchen for their evening meal. There were over 21,000 registered unemployed at the beginning of 1931 and this figure more than doubled to 52,000 in a year, with 70,000 expected by winter 1932. These numbers did not include women, Māori employed on Native Department schemes, and men under twenty. Women were not eligible for relief payments even though they had contributed 500,000 pounds from their wages to the Unemployment Fund; and married men were being sent to relief camps where they lived in primitive conditions and earned a pittance. Jobless were dependent on private charity or hospital boards for help. They had no representatives on the Unemployment Board and the government frequently ignored attempts to meet with them. 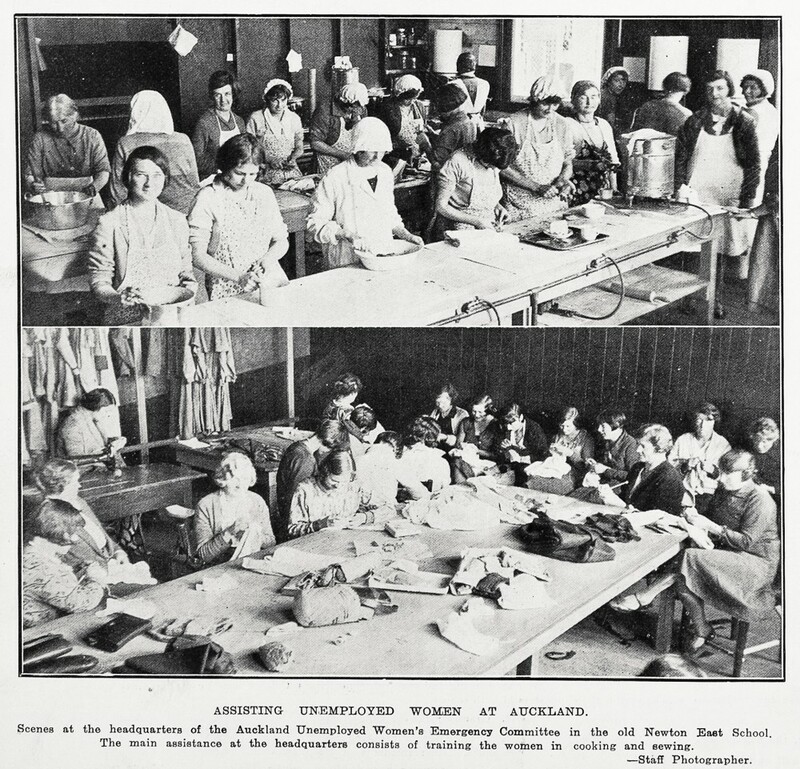 Scenes at the headquarters of the Auckland Unemployed Women's Emergency Committee in Newton East School. Auckland Weekly News, 29 June 1932. Auckland Libraries Heritage Collections, AWNS-19320629-48-4. Scenes at two new relief camps in Auckland. Auckland Weekly News, 28 October 1931. Auckland Libraries Heritage Collections, AWNS-19311028-37-1. The day before the Queen Street riot, a procession of 2000 unemployed men and women marched to the town hall to protest against relief camps. 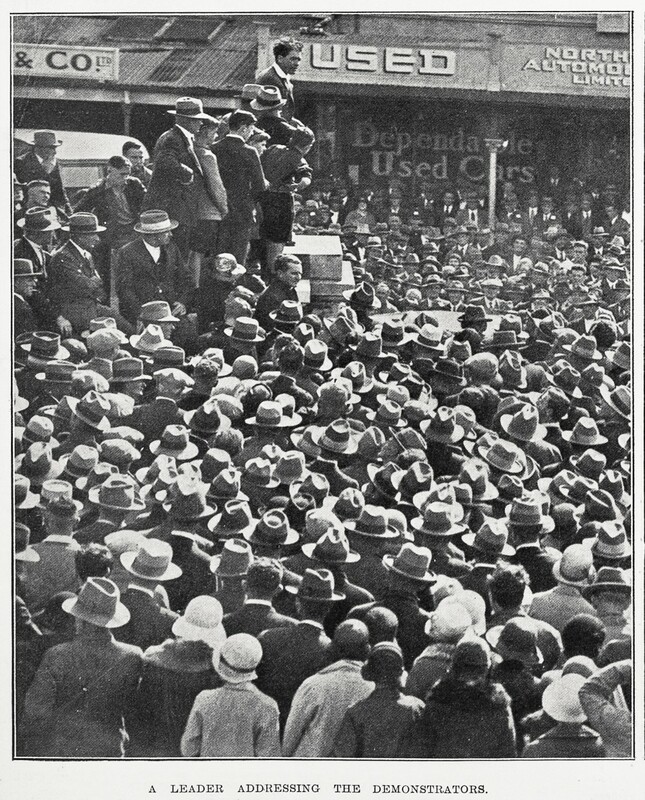 The Auckland Star belittled the march with a billboard implying only a few unemployed were involved. The demonstrators responded by marching to the Star offices, and a riot was narrowly averted after a truck driver tried to force his vehicle through the angry, densely packed crowd. 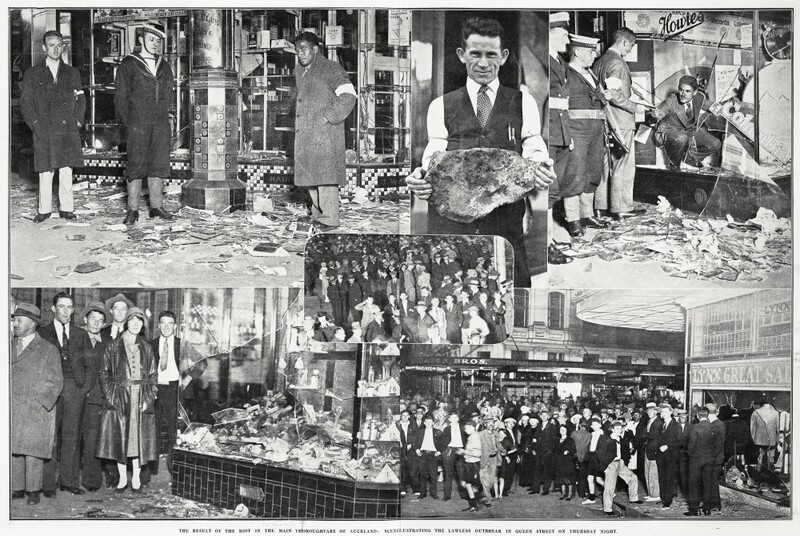 The following day, the demonstration in support of the Post and Telegraph workers proceeded up Queen Street with men and women carrying banners saying “Free milk for the schools” and “Close the slave camps.” Jim Edwards’ son was on the march, too. He lost sight of his father when they reached the town hall, then heard someone shout, “They’ve batoned Jim Edwards. They’ve killed him!” James tried to push his way through the mass of people but “… a mounted policeman spurred his horse through the crowd almost knocking me to the ground when the horse wheeled in fright and hit me with the weight of its flank.” He glimpsed his father standing on the balustrade of the town hall and then lost sight of him again. Pitched battles began and James escaped up Greys Avenue – he could hear the “terrible roar of the crowd” nearly a mile away. 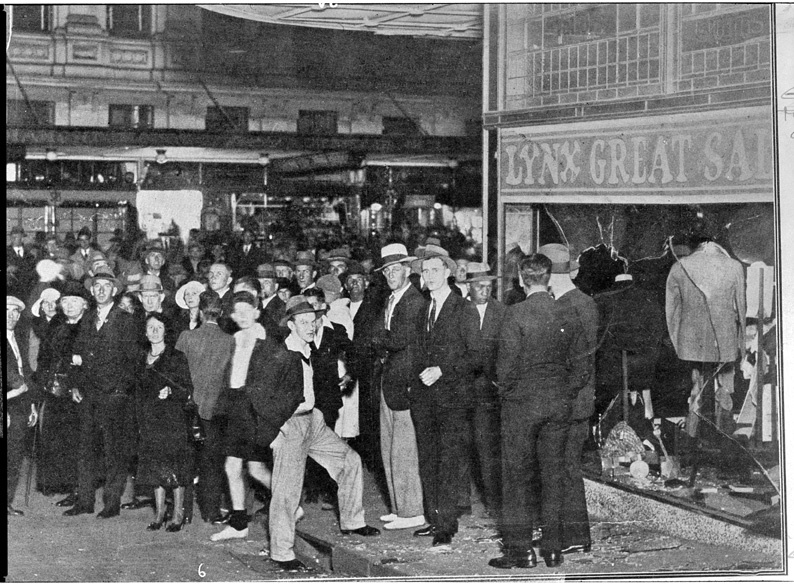 Looking east towards Queen Street showing crowds gathered during the riots. Auckland Weekly News, April 1932. Auckland Libraries Heritage Collections, 7-A4325. Montage showing the results of the riot on Queen Street. Auckland Weekly News, 20 April 1932. Auckland Libraries Heritage Collections, AWNS-19320420-43-1. The Mayor of Auckland, Mr G.W. Hutchison, said he would have no hesitation reading the riot act if the disturbances continued – every rioter would be liable to two years in prison with hard labour. This was the sentence Jim Edwards later received on a charge of inciting the Queen Street riot. It wasn’t until 1938 that the Social Security Act provided income support for families.